Did some drawings for a project related to my current campaign - thought I'd share. Looking at that, I can't avoid the impression that some architect-conjurers made a career of summoning giant creatures solely to carve up their bodies for the construction of buildings. That's a great idea actually... even better, get a demon summoner and a transmuter to work together. Summoner conjures the demon, transmuter petrifies them and then shapes the stone into building form. Nobody does that gothic viscerality quite like you do. It reminds me a lot of the upper tier of OSR materials. Thanks, that's really nice of you to say! Although there are some segments of the OSR that leave me cold, a lot of that stuff has been very influential for me. I want to live in this world now. no matter how dangerous it is. The skulls are inspired. Would you have a problem if I started making a map for Cainsworth in a similar style to this? Not at all! You should! - Get pens that work for you (this doens't mean expensive). - Be patient and be OK with throwing out mistakes. - Don't sketch, it'll take forever. Just get good at drawing in pen. - Work on it in small amounts regularly. - Assemble it as you go so you can manage space. - Plan the city out in advance so you know what you need to draw. Thanks, I began working on it. I have a couple of questions though. #1. Do you draw your buildings piece by piece on a large scale, or do you draw everything on a piece of paper? #2. 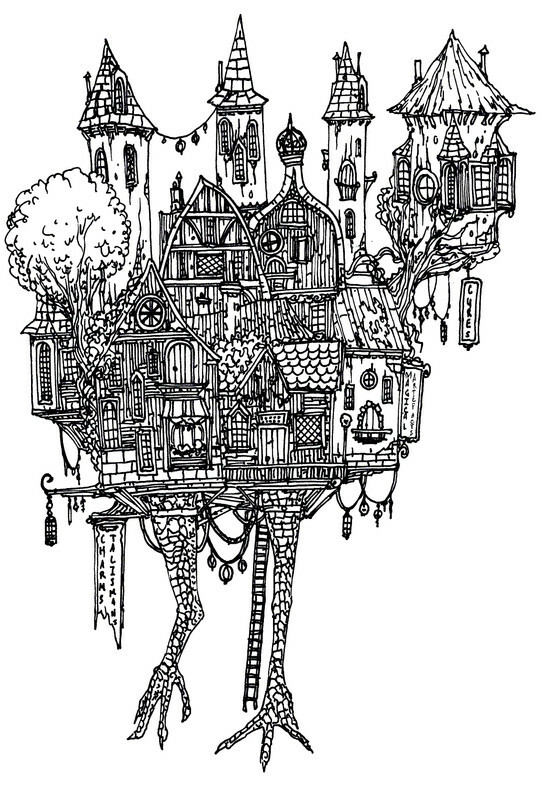 What artist inspired the way you draw buildings? Do you mean the cityscapes I've posted here, or the big map? The big map was hundreds of pieces of paper, just a ludicrous amount. The cityscapes here usually took 1-3 pages. In terms of direct artistic influences, 17th-18th century maps, the art of Sean Murray, Giovanni Piranesi, Gustave Dore, Ian Miller, and the videogames Dishonored 1& 2 would all rank high, along with old isometric CRPGs like Planescape: Torment and Baldur's Gate 2. Genial Jack is a setting unto himself. Good work as always! What is the story behind the integrated skulls; were they hauled in later, are they made of stone? What about decomposition?